Average 4.29/5 out of 48 total votes. Thor Odinson. Steve Rogers. Tony Stark. The Big Three of the Avengers are reunited at last! And just in time to save the world from total annihilation at the hands of their most powerful enemies yet: the 2000-foot-tall space gods known as Celestials. Behold the coming of the Final Host. 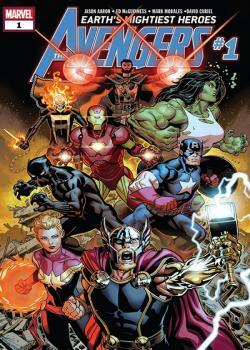 Who will answer the call to assemble for a wild new era of Earth’s Mightiest Heroes? Hint: one of them has a flaming skull for a head. And what strange, world-shaking connection exists between the Final Host and Odin’s ancient band of Prehistoric Avengers?